Oglesby Fine Arts Gallery is in the last week of its exhibition by artist and art educator Jeff Byers. 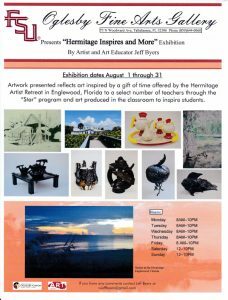 This artwork by Jeff Byers presented reflects art inspired by a gift of time offered by the Hermitage Artist Retreat in Englewood, Florida to a select number of teachers through the “Start” program and art produced in the classroom to inspire students. Jeff Byers is a long time art instructor in Perry, Florida, where he is very dedicated to his students and family. His artwork reflects through his life experiences, stories, people and nature from his past and present through teapots, watercolors and paintings. Please come in to experience and celebrate over forty pieces of his artwork at the Oglesby Art Fine Arts Gallery. This exhibition closes on Thursday, August 31st, so don’t miss your opportunity to check it out!